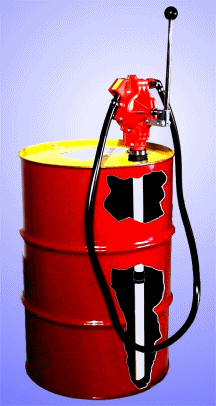 Drum faucets / drum spigots are available for standard 2" and 3/4" bung sizes (5.1 and 1.9 cm bung diameters) on 30 and 55-gallon steel drums (114 and 210 liter steel drums). They allow you to start, stop or adjust the flow while you dispense from a drum. 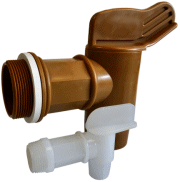 Order a drum faucet compatible with the liquid you are dispensing. NOTE: The bung on your PLASTIC drum may have more coarse "buttress thread," which requires an adaptor to accept the pipe thread on Morse drum faucets. Morse drum faucets are NOT considered "food grade"
Drum faucets with all polyethylene construction. Polyethylene drum faucets are ideal for use with non-flammable, corrosive liquids which are often packed in polyethylene drums. Molasses Gates are for viscous liquids. They are made of gray iron and have a brass sliding plate. These drum faucets are lockable with a pad lock. They are NOT self-closing and NOT for use with flammable liquids. "Molasses Gate" refers to the viscosity of molasses. These faucets are NOT considered "food grade." Drum Faucets to control flow of liquid from a drum. Stop, start or adjust the flow while you empty drum.